Back when this blog began, I knew things. I knew them confidently. As time went on, the more I learned, the less I knew. Yet there is a value in knowing something confidently. You've got something jingling in your pocket right now. 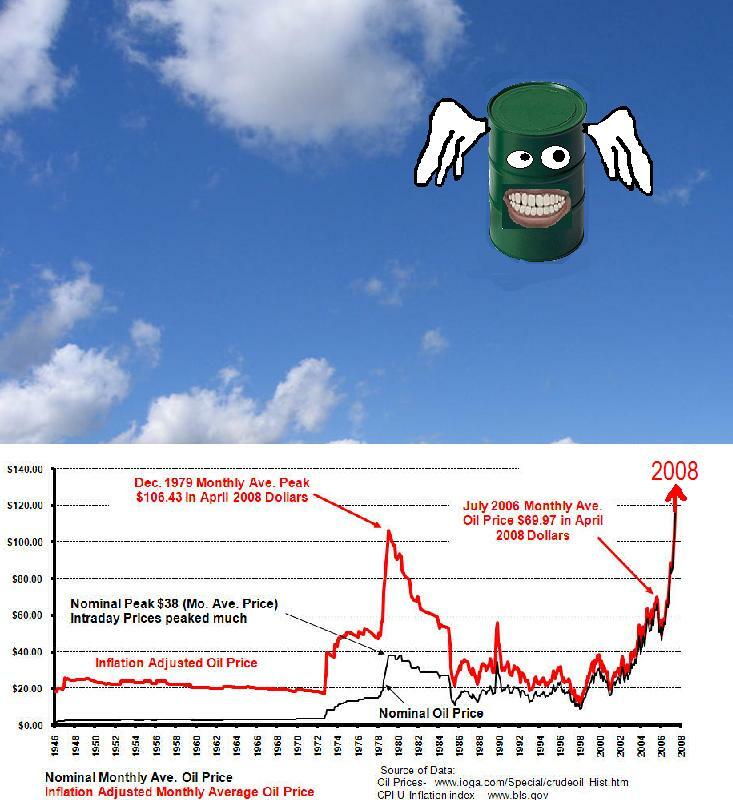 The petro dollar. Right now you can literally use it to buy things of lasting value. This icon won't hold value forever. A penny saved is a penny burned. Buy real things. Swords and plows. Seed corn. Oil itself is not part of the living Earth. Buying a cell phone or a new TV is like planting a dollar bill in the ground. It will not grow, it will not bear fruit. So, how long can it go on? Hold up one hand and count some fingers. There you go. 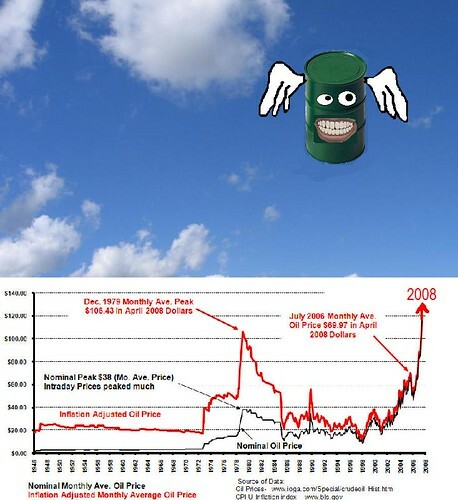 That is a good estimate, in years, for how long we have before peak oil hits. Part of my detachment from this space is peak ennui. Things haven’t changed much in the last few years. Yes, the supposedly predictive became reality, the peak is effectively in. Yet rank and file North American are content to debate pepsi coke and “opening up” coastal areas to drilling. And the throttle has stuck on the dollar printing machine. Quick, what is that word, the one that describes a person who feels gravity does not apply to them? This a transitional age. Our energized civilization is in a liminal state. From here on, the strange unknowns rule, Britney Spears is in a haired / hairless state until observed. Everyone at General Motors scratches their heads and wonders how small next years Hummer might be made, and if it perhaps may qualify for a carbon credit if the dashboard is carved out of California charcoal. Call it the Hummer: Gore Edition and hedge some bets. So out of all this uncertainty, there are yet things I know confidently. Much of it refernced elsewhere, notably the Energy Bulletin. Oil – the top isn’t in. Production hovers like a flying saucer between 80 and 90 million barrels a day. There is will stay, until it breaks south forever, probably around 2010 all else being equal. So c’mon – a little relief at the pump? I mean, sixty dollars to fill twelve gallons, that isn’t the way Eisenhower drew it up! Go ahead, waste air and blame investor speculation. All the countries with dollar reserves and large economies are content to bid up the price of oil, knowing it is one of the few ways to get value out of the increasingly pathetic petro dollar. Then they turn around and subsidize domestic supplies. China does this. And why not. What else can they use their dollars for, other than cleaning algae out of their pond for the Olympics? The interesting thing here is that the losers are ostensibly Americans, because no one in America has any dollar reserves. (Never mind Zimbabweans.) Less trips! Shorter distances! This is not my beautiful non-negotiable lifestyle. As the economy deteriorates, demand destruction will NOT take place immediately. There are too many dollars sloshing about. Look for oil to settle between $175 and $200 a barrel by the end of the year as a best case. Will the last person out of town turn off the lights. Even as the Department of Homeland Security spends billions on police state gadgets to “secure” the airlines, the airlines are teetering. This is not a surprise to anyone who thinks about energy. But what happens the day half the airlines go out of business, and the remaining airlines index prices right to fuel costs instead of trying to undercut each other? The sad subtext to this story is Boeing is developing a fuel efficient plane known as the “Dreamliner”, supposedly in part because some manager at Boeing read Deffeyes “Hubbert’s Peak”, yet this plane has not yet been delivered and looks to miss the sweet part of the market, the one where planes are acquired new. When deciding where to lay our corn bets, one must figure on heavily subsidized bio-fuel distilleries surviving to produce a welfare fuel which provides 15 percent less energy by volume than gasoline. (I wish I could get a piece of that action, but I have no ties to organized crime.) Meanwhile, unable to afford feed, ranchers will continue to thin down their herds of steak racks, keeping prices low today, and raising the price of meat through the roof next year after the full weight of the Midwest floods ripples through the commodities market.